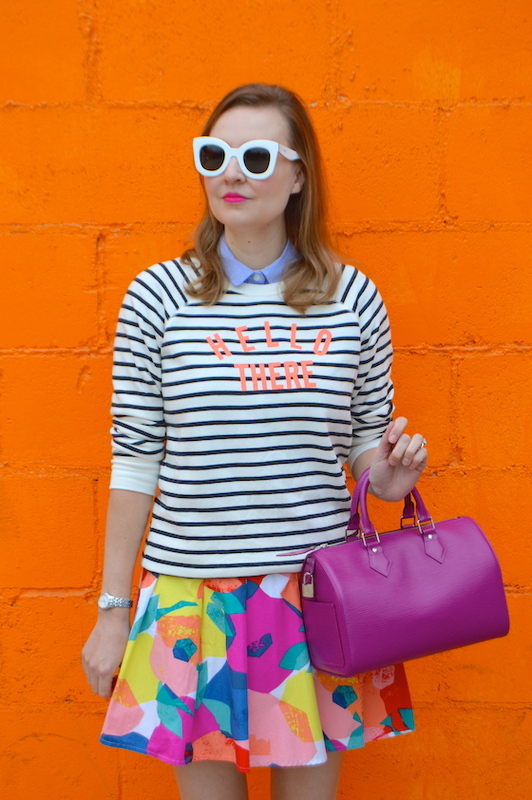 Hello Katie Girl: Why, Hello There Statement Sweatshirt! Why, Hello There Statement Sweatshirt! 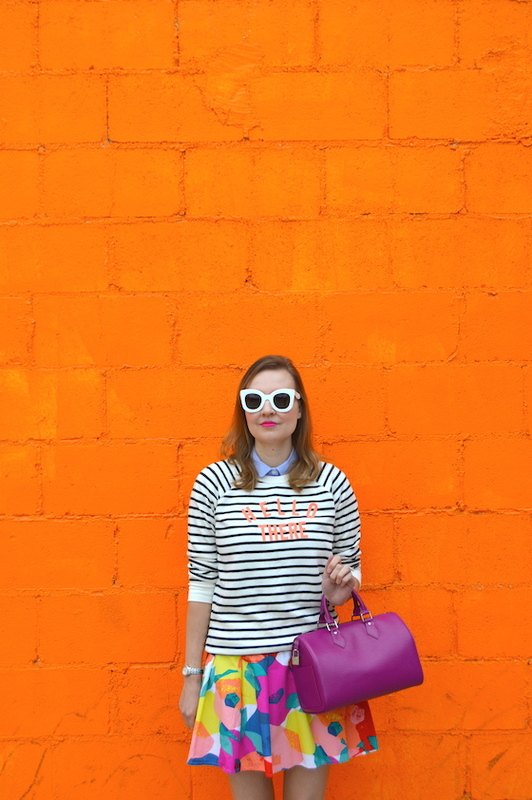 I'm back at the "Cheetos" wall and this time it's to show off my new statement sweatshirt from Old Navy. The statement sweatshirt has been around for a while now, but I've only recently become addicted to the comfy, chic appeal of this trend. As someone who usually veers on the dressier side of things, I'm drawn to the idea of pairing something that's warm, cozy and casual with a skirt for an unexpected twist. My new affinity for sweatshirts has become especially appealing given the situation with our weather here in Los Angeles, which has been unseasonably cold and rainy. I think it's quite fitting that the writing emblazoned on the front of this sweatshirt is also done in "Cheetos" orange. (I should really patent that color!) It's a perfect match for the wall behind me! 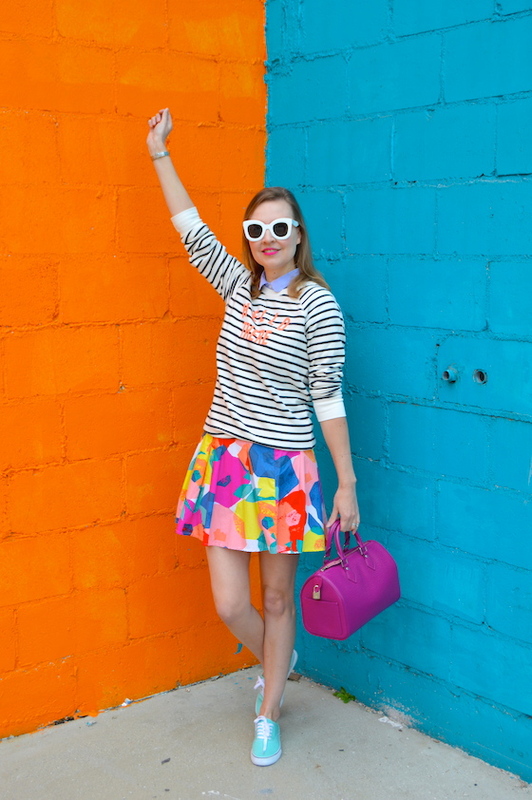 I paired the sweatshirt with a colorful skirt from Kate Spade Saturday, which is a now defunct branch of Kate Spade. Oddly enough, I never bought anything from them when they were in business, but now that they've gone out of business, I've become obsessed with picking up pieces from their collection off of eBay. Perhaps my lack of support for the company helps to explain why they went out of business! Below you will see some of my other selections for fun, not to mention warm, statement sweatshirts. Some of these tie into some of the things I love: pizza, lettuce (well, kind of), palm trees and colors, as is the case with the J. Crew sweater listing colors in French. I'll definitely be adding more statement sweatshirts to my burgeoning collection soon, especially if this rain keeps up! One last thing: in the pathetic attempt to make fun shots of me being quirky like other bloggers and more notably people on Instagram, here's me jumping! I really feel like this shot captures an "Air Katie" vibe, which makes me think that maybe instead of blogging I should spend more time in playing basketball! Hello Katie! I am new to your blog and enjoy it very much. The locations and clothing/bright colors make me smile! Thank you so much for sharing with...well...me! Have a terrific day. Love your outfit ! So bright and colorful!!! I was just at Old Navy and saw this sweater! It's so cute and I love how you styled it with the background too! 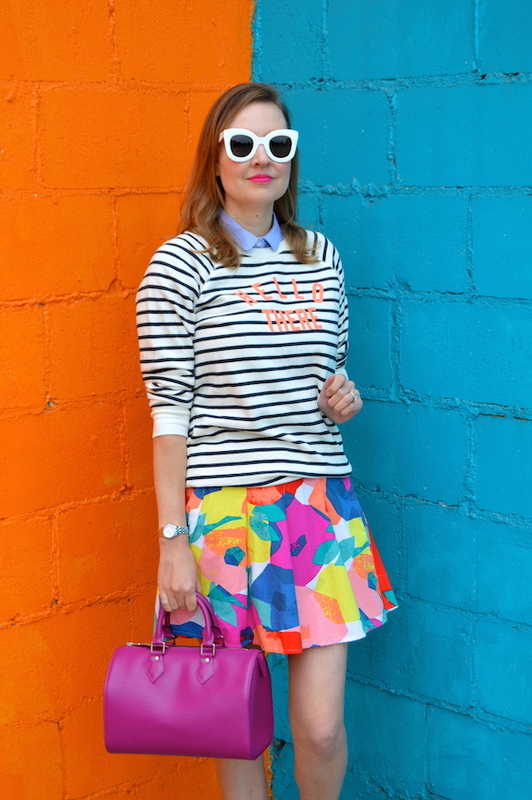 :) Great print mixing as always! Such a fun look! 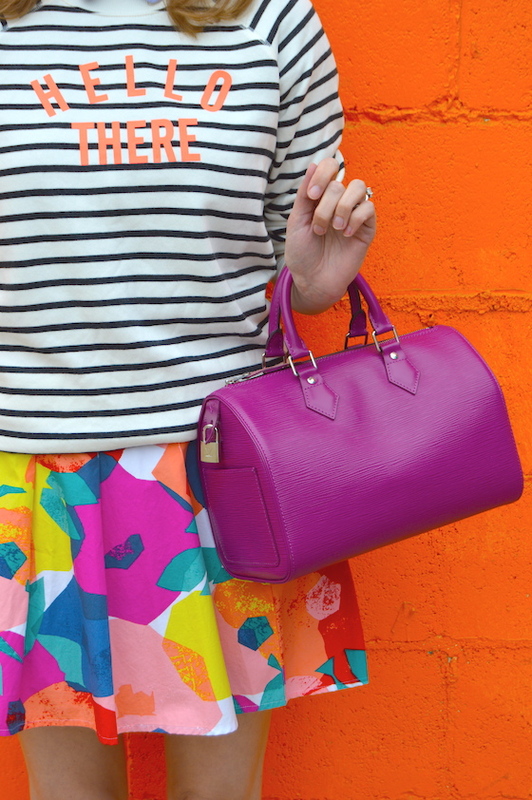 Love everything, especially your top and bag! Beautiful photos! I love Old Navy, so I am gonna have to look for this sweatshirt! 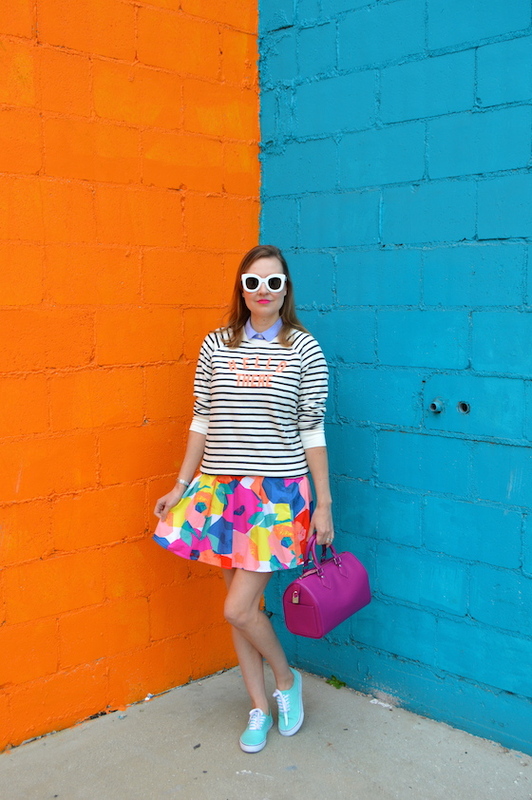 I love how you styled it with the bright floral skirt! Goodness, this look and You are so cute! So wonderful to see such fun and pretty colors this time of year. 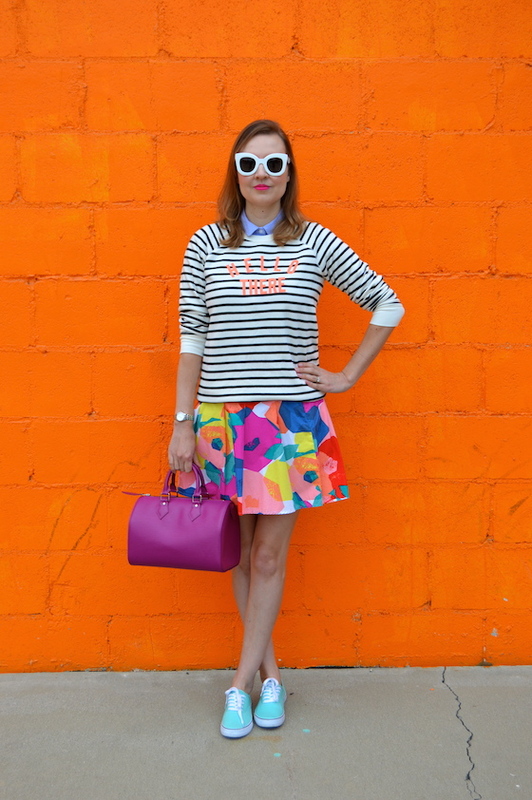 OMG how much I love this look and how honored I am to tell you you are my featured blogger this week, Katie. I went to Old Navy to get the sweatshirt from here but I settled for the "Bon Voyage" one since this one was sold out. I will be ordering this and the floral one though. I also need the one from J. Crew and your adorable aqua sneakers. Here is the new Thursday Moda linkup below and your beautiful self being featured - you are welcome!